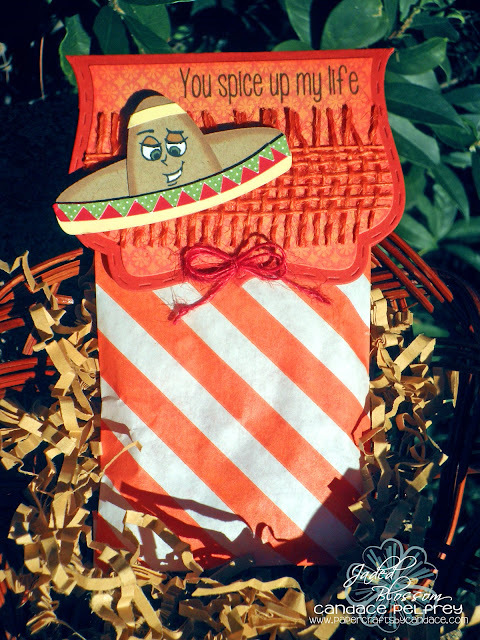 Paper Crafts by Candace: Stamp Release Blog Hop! Hi Everyone! Welcome to Jaded Blossom's November Release Blog Hop. So, did you enjoy all the projects this week. I know I say this every month but I just LOVE this Release!! Now if you're here from Jamie's Blog then you're in the right place, if you're just passing through start at the beginning (Jaded Blossom) because you don't wanna miss anything!! I also have the complete line up at the bottom. If you missed my projects this week here is the highlight of them..
Now on to my blog hop project! LOVE the new stamp set Mexican Food!! Soo many cute sayings! I also used the Jaded Blossom Fancy Topper die and added it to the top of these Itty Bitty bags sold here. Isnt the sombrero dude the cutest?!! He is cut from Mexico Files over at SVG Cutting Files. And then I added a Retro Peachy Keen face. And of course we have to have a deal for you right? This weekend only you can get the entire release package for $ 87.99 FREE SHIPPING (only to those that order the Entire Release. What is a blog hop without some blog candy? This month Jaded Blossom is giving away a $15 Gift Certificate to Jaded Blossom Store. And I am the last on the hop! This is so cute!! Love the little face. Absolutely LOVED all your projects this release!! This is so cute! I love all the fibers on it and that hat is so fun! This dog reminds me of wishbone!also love the drunken sombrero what face stamp did you use for this? I am so loving the bitty bags with the topper on top!! Great release!! Really great projects all week. Ha, love todays project! So cute. Great week. wow!! That is all I can Say!!! Everyone's Projects were so totally Awesome and I enjoyed the hop Very Much, Now it is time to go and shop!! Thanks for sharing all your talent!!! Candace thank you for the wonderful release and fun hop. Really enjoyed it and have already shopped. Can't wait to recive my happy mail and play. Such a cute little sombrero. Love it. What a great project, and such an inspiring hop! What a GREAT project! This whole release is awesome!!!! Love this treat. Love the sentiment. Your projects this week were amazing. Loved them all. Would be adorable with some spicy almonds. Trying to give a bit healthier gifts this years. Arriba!! Great caboose!! Loved all the projects and yours are awesome to finish it off! Lol, I love your adoable treat topper and the sentiment is perfect..
Really love this cute little treat bag!! All your projects this week rocked!! Candace, fabulous projects this release! Love each one - so Beautiful. Thank you for sharing. This is too cute! I love the burlap on the tag too! His face is perfect! Thanks for releasing such amazing stamps! Candace, I love all your projects. the are always super cute and very inspirational. thanks for sharing your creative genius with us all. I love the stamps in this release and look forward to adding them to my collection. Once again you all had an amazing hop! I am looking forward to a shoot at your design team...great hop! Great job with your projects and with a great blog hop. I do not do many of these hops but yours looked really interesting to me. Thanks. Thanks for sharing all your great projects. Love them all. I always look forward to seeing your projects. They are great. Love this treat bag! Perfect face on the sombrero! I LOVE this treat bag! He's so freaking cute! All of the projects in the line up are awesome!! You know I order before I hop so I won't miss out on them. They sell quickly!! Thank you for the great customer service, product & awesomeness!! super cute love the sombrero !!! tooo cute !!! Jaded Blossom BIRTHDAY blog hop! Jaded Blossom Black Friday Sale! Stamp Release Reveal day 5! 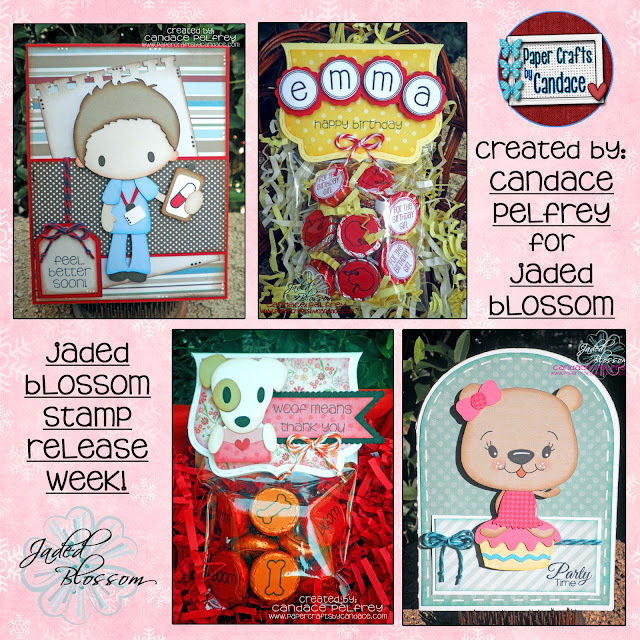 Jaded Blossom Fancy Topper Die Blog Hop!